Since I temporarily can't deliver, at least let's make some promises. Every politician knows they usually work very well, fulfilled or not (mostly the latter). Order of listing is arbitrary. 1. Assessment and mitigation of cancer risk over the lifetime. Incidence, mortality and survival of various cancers nowadays and in the past for various age groups. Potential methods of their early detection, at least for some of them. Trends in incidence and survival in the last 30 years of medical development. Other life-threading hazards. 2. Discussion of difficulties in diagnosing early melanomas (most dangerous type of skin cancer) with some fail-safe precaution approach. 1. A glance at the market situation in terms of Microsoft vs the world of open source battle. Possible future outcome. 2. Some generic thoughts about social networks including picking up the idea, key implementation aspects and further portal development. Some retrospectives to most popular Polish web 2.0 site nasza-klasa.pl. 1. How to buy a very safe car - combining crash test results with medical losses by make and model as well as some other aspects of choosing a vehicle offering most protection. Visualisation about how suitable (or not) modern crash tests are. 2. Ford Motor Company as an example of serious strategy flaws in motoring business. 3. Plug-in hybrids and where they belong. Options of sustainable motoring and potential issues. Maybe a cool and handy calculator will come in place. 4. Which types of vehicles (breakdown by classes and fuel types) are driven hence pollute most? In the search of Jevons paradox, some handy findings were discovered. 5. Bias in German motoring press. 6. A rant about the best sports car in the world. 7. Petrol engines that beat their diesel counterparts. 8. Car industry in numbers. 9. Battle of all wheel drives - quattro vs xdrive vs haldex vs 4matic - torque based vs skid detection based. A proof of the concept that only AWD cars should be made. 10. Hybrids vs diesels rematch since new players have come into field. 11. Samples of rather obvious designs and product planning faults, including Lexus and Honda. 12. A rant about some cars from VW AG that are finally thrilling. 13. Polish translation of one of the best guides to defensive driving I have ever come across. 14. A word about fuel/energy efficiency of various means of transport. Do we really save much by taking a bus? Share of various means of energy consumption of a household. 15. Formula 1, what matters there. A car or a driver? 1. Guidelines how to buy a proper city bicycle. Forget once and for all about pointless traffic jams. 2. Seriously professional advice how to cut you fuel consumption four-fold. 1. Music this good you'll hardly believe your ears. Dunno, mate! At some point! It'll take at least a week from now to start. But at least now I have some way to memorize ideas. I'm preparing the next three, hopefully interesting articles about motoring but these take more time than expected, a resource I'm currently short of. People usually are short of it these days which I consider one of the major flaws of life, if you ask me, as it often means they focus on petty little irrelevant details instead of on things that matter. So for the sake of continuum, I'd like to share a brilliant find with you. I randomly encountered a bloke who really understands what a car is for. It's not to commute and pollute, to put on 30 thousands miles per annum, to have an enormous boot and to be hugely practical, like a box with wheels attached to it. When we have plug-in hybrids charged with renewable electricity, it may serve such purpose. But now a car is for something else and this chap knows it. Enjoy. Not only the understanding, but the quality and ingenuity of filming and editing too. Should you be interested in soundtracks, as second comes You and Your Hand by Pink and the third is Empty Streets by Late Night Alumni, possibly a version called "original mix". A good quality car is the one that cruises about as quietly as possible and isolates its passengers from noise, vibrations and harshness of the ride. Shouting? Growling? When you put your foot down, yes, it may be desired by some. But for another 99% of the time you want it to whisper, not to cause a headache. All measurements are in decibels. 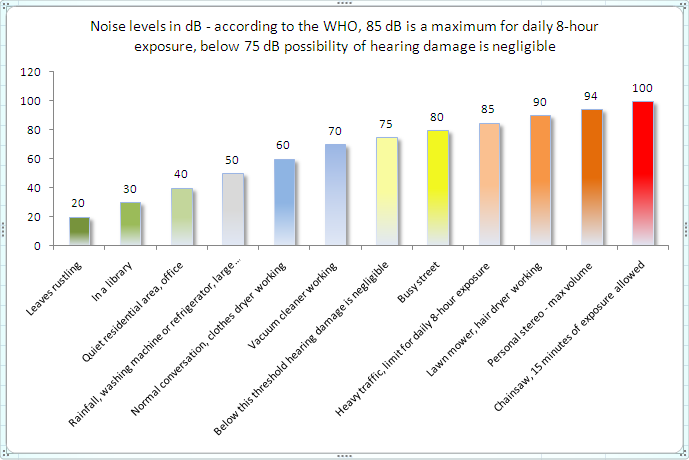 While the decibel as a way of measuring intensity of noise is a complex term, it can be very easily demonstrated. There is an excellent webpage with flash animations presenting you noises decreasing by 3 or 1 or 0,3 decibels. Try it. This will allow you to see the differences between compared cars. It’s essential to realize that decibel is a logarithmic measure which means that relatively large changes in noise level result in little changes in decibels measured. Then look at this chart to see what's what in terms of noises around us. The list of cars has been ordered by the noise measured inside the car at 70 mpg (~112,5 km/h). If results were equal, a noise at full throttle was considered - the lower, the better. Source is Edmunds InsideLine full or comparison tests. To put V8 diesels in perspective, two additional cars: Audi A8 4.2 TDI and BMW 745d were measured by Auto Motor und Sport at 100 and 130 km/h. Measurements were then interpolated and floored (rounded down to the nearest integer). The upper part of the list almost certainly contains the quietest cars on the market today. The lower may not be as representative. Some cars absent here may land somewhere between the ones measured and placed there. A clear conclusion is that while the top is occupied by very expensive vehicles, it is by no means a necessity to spend a lot of money to get a really silent car. In case of some cars like BMW 335i and Toyota Prius, more than one measurement was available. Lower results were picked in such cases as one can assume that readings in noise level measurement procedure can much easier be overstated (due to presence of additional noise sources like something outside the moving vehicle during the test) than understated. It's nearly impossible to unintentionally make test noise readings lower in a vehicle cruising at a given speed. Anything this Lexus does, it does it quieter than Rolls Royce Phantom. Not bad! The only car that can possibly beat the largest hybrid is the Maybach. Edmunds InsideLine did a full test of it and... they didn’t measure noise levels! The Queen Elizabeth is where she's supposed to be - at the very top of the list. That's a true surprise, to see this Bimmer here. But when one thinks about it for a second, it becomes somewhat logical. The 535i has a twin-turbo petrol straight six. High torque due to charging means little revs are needed to cruise what decreases the noise. And then come the turbines themselves, clogging the exhaust manifold and quieting the car even more. Excellent performance from an unsuspected contender. It was certain to find this car close to the top. LS460 follows its hybrid version closely. Like father, like son, the 335i twin-turbo handsome looking brute benefits from the same quietly beating yet potent heart. Big powerful SUV means there's lots of space and carrying capacity for decent sound insulation. Big V8 in low revs doesn't shout either. Softly-sprung LR3 is an oasis of comfort also in terms of noise level. A transcontinental grandtourer can growl a bit when floored but has to whisper when not. Can you recall all those people mocking Korean cars and disrespecting these as cheap and nasty econo-boxes? Jeremy Clarkson calls this car "the new King of the Road"
Handsome looks, front axle shifted forward, rear-biased quattro, small petrol engines all fitted with turbochargers - very good. And now it turns out the B8 A4 is also very quiet. Very quiet for a not that expensive compact SUV. Same can be said about this Lincoln. Decent result - the Highlander Hybrid makes sense not only in terms of fuel economy but also the quiet ride. You'd expect the big Bentley to fare better, wouldn't you. Not as refined as its petrol rivals. SL can be excused by its retractable hardtop, one of the best inventions in car body design. Good result for a relatively inexpensive car the Camry Hybrid is, to see it among much more pricey vehicles. Disappointing. Its petrol counterpart is much higher in the rank. Is it really the ultimate luxury sedan from Audi, so low in the rank? Quieter than rap music its stereo plays all the time. Mazda 6 fares well in quietness department also. The lightweight hybrid has no chance of having thick sound proofing, still performs well, most likely thanks to CVT gearbox which can adjust engine revs as precisely as needed and low drag decreasing wind noise. In the past, big cats used to tiptoe when moving about. This is a turbocharged car so same principles as in case of twin-turbo bimmers should work also. They don't. Little sound insulation? The handsome S5 was born to growl so its poor performance can be somewhat excused. Lots of good things can be heard about Acuras so I was expecting these to fare much better. After achieving scary fuel economy of 11,2 MPG in Edmunds InsideLine full test, the big Audi finds itself quite low in this rank too. The Merc GL450 achieves 15 MPG and is at the opposite end of the list. Very good for a small diesel sedan. The common rail injection smoothers the rattle. Typical for a diesel, high low-end torque allows the car to cruise at low revs and helps too. As the fifteenth child of dr Ferdinand Piëch (yes, he really has 13 children, the 14th is the Bugatti Veyron) this car cries rather loud as for an ultimate VW sedan. No comments. This car weight nearly 2600 kg (~5700 pounds), has an engine from a locomotive which barely has to rev to power the car along and yet it finishes last here. Late entries - after tidying up the post I realized Volvo XC90 wasn’t enrolled. So quick check places it as follows: the 2003 2.5 turbo is out of business with its 75 dB, the 2005 with Yamaha V8 (68 dB) is placed between Jaguar XF Supercharged and VW Passat 2.0 turbo and the 2007 V8 Sport performs very well and with it 64 dB and 84 dB (cruising and full throttle) lands somewhere after the BMW 745d. What a car is actually for? Quest for the quietest car - which one is the most silent? Any information provided here is, despite best effort to keep it as accurate and precise as possible, of a general nature and cannot substitute for the advice of a licensed professional. No responsibility is taken for the results or consequences of any attempt to use or adopt any of the information presented on this blog.